On 14 April 2015, the Foreign Affairs Minister of Australia, The Hon. 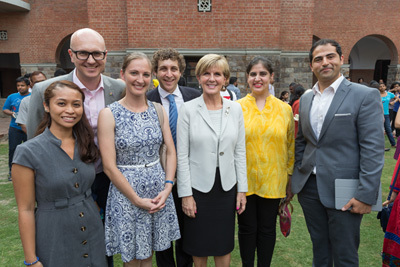 Julie Bishop MP, addressed an audience at St. Stephen’s College in New Delhi about the benefits of people-to-people relationships at a youth level. Ms. Bishop spoke about the launch of the Australian Government’s New Colombo Plan in India and mentioned that hundreds of University students will now have the opportunity to take part in structure exchange programs and internships in other parts of the region, including India. After the formal presentations, Ms. Bishop met with AIYD alumni and steering committee members and extolled the virtues of programs such as AIYD in the context of the Australia-India relationship.